If the name Adam Richman means nothing, this post is most likely not for you. But if you’ve ever watched this not-nearly-as-fat-as-he-should-be man in action, and wondered what it would be like to have people chant your name as you stoically munch your way through awe-inspiring mountains of food, you may want to make your way down to PING tonight. 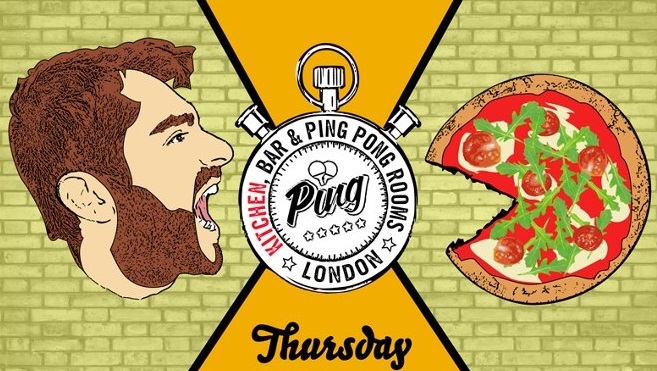 The cocktail bar/table tennis hall/pizzeria combo on Earls Court Road is hosting its second Man v Pizza event this evening, but it’s not for the faint-hearted. Contestants will have five minutes to polish off two of PING’s (off-menu) twelve-inch Margheritas. Bearing in mind that the current world record holder, “Furious Pete”, takes 41.31 seconds to demolish one twelve-incher, two in five minutes on the amateur circuit is no mean feat. At the inaugural contest, held a couple of weeks ago, neither of the two leading contenders quite managed to clear their plates, but it was so close that the scales had to be brought out. The winner was finally crowned after his leftovers weighed in at 60g to his closest rival’s 80g. Impressive stuff. And to the victor the spoils. At PING you won’t leave with a wacky t-shirt or commemorative baseball cap. Your photo won’t adorn a hall of fame on the wall. Instead, you get free pizza. PING will give you free pizza FOR THE REST OF YOUR LIFE. If that’s not worth entering for we don’t know what is. And to make things even more exciting, entry is free and the pizzas are great. Check out our review of fanatical pizzaiolo Bruno’s creations here. We have also heard rumours of exciting developments including cheeses and meats being produced on site in the near future…we’ll keep you posted.